The i240 was produced during 1985 and 1986 along side the i200, although it was never offered for FISA group B homologation. It was based around the GT/E coupe but featured a larger 2.4 litre engine. Manta 400 Rally car quad Halogen headlamps were once again used, complemented by the Manta 400 deep boot spoiler.The standard package included a 2396cc engine with high lift cam, solid lifters, uprated valve springs, gas flowed head and re-mapped distributor to increase power to 136bhp and loads of usable torque (210 lbs/ft at 3800 rpm). To cope with the extra power, the standard front brakes were replaced by vented discs with bigger calipers, a Limited Slip Differential was also frequently fitted. The Recaro seats used the same black 'Opel Sport' cloth as featured in the other Irmscher models. Another fitted option was the Irmscher 'Road' body kit, which flared the arches out to give a more aggresive stance. As the i240 was fitted with Quad Headlamps from new, the headlamp wash wipe was not applicable and as such the front airdam was not fitted with washer jets. The chassis build plate should not feature the model code for the GT/E, which was XR3. The i240 was only in production for 2 years from 1985 and only sold in very small numbers from the UK Irmscher franchise, Steve Thompson Cars Ltd, of Walsall. It is believed that 7 RHD i240's were imported during this period, all of which were Coupes. 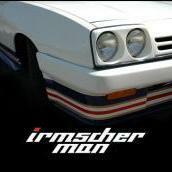 Irmscher could also convert existing cars to the i200/i240 specifications. The list price was considerably more than that of the standard GT/E, thus the small numbers of production, making them very rare and collectable.